In particular if you live in a hard water area, any appliances which heat water will develop limescale. The limescale makes appliances less efficient as they will need to work harder to get the job done. In your kettle you can see the limescale on the bottom but for other appliances like your washing machine, as the element is hidden, you can’t see the potential damage being done. Descaling once a month will make appliances more efficient and cleaner. 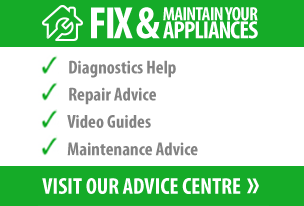 Take a look at our appliance cleaning products. This is one of those jobs that by not doing it, has the potential for ruining laundry. Washing powder builds-up in the soap dispenser drawer over time and as it’s an ideal environment for bacteria to grow, this causes black mould to develop and smell. By using an old toothbrush you can scrub away the grime in the hard to reach places in the drawer. Don’t forget to clean the inside cavity of the machine, when you have removed the drawer. Allow the drawer to dry out after doing laundry by leaving open, this can help prevent mould build-up again. Find out more information in our advice centre. Depending on the make and model of your vacuum cleaner most bagless vacuums have filters. They are usually washable and some say on them how often you should wash them. This information should also be in the manufacturer’s guidelines. If your filter isn’t clean, the vacuum will be less efficient as it is having to work harder to eliminate dust and other allergens. This isn’t a job that should take up too much of you time. Remember to let filters dry thoroughly before putting them back in. If your filters are looking worse for wear look for replacement filters. This is one of the ultimate jobs to put off depending how grimy your oven actually is. If you cleaned it after Christmas, good job! However if you can’t remember the last time you cleaned it, it’s probably best to tackle it sooner rather than later. The longer baked on food stays on, the tougher it is to remove. If you have a self-cleaning oven refer to the manufacturer’s guidelines. Soak oven racks in hot water and washing-up liquid for two hours or if needed longer. You should then just be able to wipe them clean. For the oven door and inside of the oven take a look at our oven cleaners and accessories. If you have a frost-free freezer defrosting won’t be an issue! If you don’t and frost has accumulated considerably, defrosting is a good idea. The frost can take up space leaving less room for foods and also means your freezer is working less efficiently. A common method for defrosting is placing a bowl of boiling water in your freezer and closing the door, the steam will help loosen the ice so it can be removed easier. If placing the bowl on a shelf, place a thick towel underneath to prevent any damage to the shelf. See our accessories to help with defrosting your freezer. 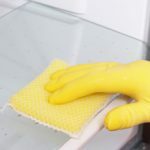 As part of your New Year clean up, if you have stains which are proving troublesome to remove, take a look at our Ultimate Guide to Stain Removal.